A prime example of his work is his current installation “At the End of Daybreak.” The title and content reference the 1939 book Cahier d’un retour au pays natal (Notebook of a Return to the Native Land) by influential Martinican writer Aimé Césaire, a central theorist/poet of the black consciousness movement, Negritude. Volcanic imagery appears throughout Césaire’s writing, as do related questions of economic conditions after natural and unnatural disasters, place specificity, creative destruction, rebuilding and remaking, trauma of forced remaking, and unlearning colonial mindsets. 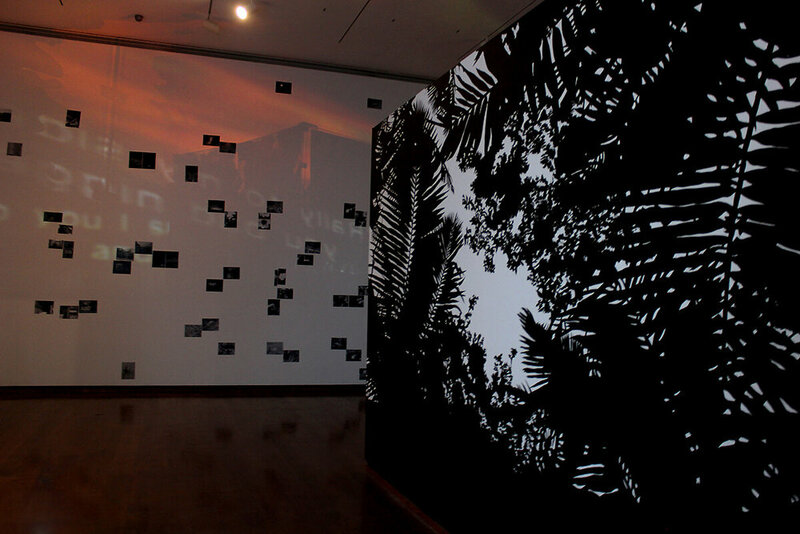 Cruet’s installation uses video of volcanic activity projected onto a large, semi-translucent cube, evoking such questions and reflections that Césaire engaged. In Cruet’s use, the questions are not specific to African diasporic colonial experiences in the way that the Negritude movement in Césaire’s time was, but it speaks to African diasporic colonial experiences among other diasporic and native colonial experiences in the Caribbean. This piece is currently on view, along with others by Cruet, at the Everson Museum in Syracuse, New York as part of the exhibition “Seen and Heard.” Curated by DJ Hellerman, “Seen and Heard” was planned as a commemoration of the hundredth anniversary of women’s suffrage in New York state, sparked by a piece in the museum’s permanent collection: Barbara Kruger’s “Who Speaks? Who is Silent?” The exhibition “explores the use of the arts as a catalyst for social change,” showcasing the work of nine contemporary artists alongside works several of them selected from the Everson’s permanent collection. “Art of any medium has the power to challenge assumptions and inspire passions as nothing else can, and artists harness that power to analyze humanity, initiate tough conversations, protest injustice, and affect emotional and systemic change,” the exhibition description asserts. The other artists in the show include Mildred Beltré, Yvonne Buchanan, Cassils, Stella Marrs, Jessica Posner, Jessica Putnam-Phillips, Kevin Snipes, and Holly Zausner. They vary in their visions and persuasions of what liberation means, or what facets of liberation they are interested in achieving, but share an “explor[ation] of the language and tactics of protest.” “Seen and Heard” will be on view through August 27, 2017.